The U.S. Senate – which calls itself “the world’s greatest deliberative body” – came within a single senator’s vote on Friday of violently disrupting the health and well-being of millions of people just so some members could partially satisfy their half-baked campaign promises. The nation is extraordinarily lucky that Maine sent two people to Washington, in Sens. Susan Collins and Angus King, whose commitment to public service would not let them to take part in such a mean-spirited and reckless political gambit. Credit is especially due to Collins, who stood up against her party’s leadership as one of only three Republican senators (along with Lisa Murkowski of Alaska and John McCain of Arizona) to defeat what was not just a bad bill but also a horrendous legislative process. King, an independent who caucuses with the Democrats, had been consistently on the right side of this issue, but he acknowledged that what Collins did Friday took special courage. Read the rest of the story by Deirdre Fleming. Unlike some states, Maine can take a witty approach to highway safety. Danger lurks around every corner when you’re whizzing along behind the wheel at 70 mph. Road safety is no laughing matter. Then from around the next bend in the road, it appears – 12 feet high and flashing in yellow LEDs. A state-sponsored dad joke. Along Interstate 295, electronic roadside signs sponsored by the state Department of Transportation have been doling out gentle reminders, good advice and pun-filled witticisms, all while hewing to the usually drab responsibility of reinforcing road safety expectations. Read the rest of this story by Matt Byrne. AUGUSTA –– Maine Secretary of State Matt Dunlap said Monday that he is unlikely to release any state voter registration data to the federal voter fraud commission to which he was appointed by President Trump. Dunlap said he will reject a second request for the data from the commission’s vice chairman, Kansas Secretary of State Kris Kobach, who promised last week that the data would be held in confidence at the federal level. But Dunlap said he is uncertain that the federal Freedom of Information Act would allow the data to be protected from disclosure once it is in the federal government’s hands. He said he wants the commission, to which he was appointed in May, to first set goals for what it hopes to achieve as it investigates Trump’s claims of widespread voter fraud. The secretary of state also said he wants the commission to figure out how it intends to protect voters’ privacy rights before he hands over any statewide voter data. Read the rest of this story by Scott Thistle. It came after her Friday vote against Republicans’ latest plan to repeal and replace the Affordable Care Act. She was one of three Senate Republicans to cast key votes rejecting it, putting one of the party’s major goals in jeopardy. Read more of this commentary by Michael Shepherd. As two home energy improvement business owners, we care about the greenhouse gas initiative because the proceeds from it support energy efficiency initiatives through the Efficiency Maine Trust. It sets an annual cap on carbon dioxide emissions from large power plants in the North East. Power generators can buy and sell emission allowances at an annual auction under the program, and that revenue goes back to the states. Since the initiative’s inception, Maine has received $86 million from carbon auctions. A significant portion of that goes to programs helping Mainers invest in cost-effective weatherization and heating efficiency improvements for their homes. That’s where companies like ours come in. We provide clear information to homeowners about opportunities for energy efficiency improvements and put those solutions to work in Maine homes every day. Read more of this commentary by Matt Damon and Bo Jesperson. While the federal government pulls back from global efforts to reduce greenhouse gas pollution, the New England states are considering more aggressive curbs on power plant carbon emissions. The Regional Greenhouse Gas Initiative, or RGGI, is a market-based cap-and-trade program that sets limits on carbon-dioxide emissions in nine states, including all of New England. Power generators can buy and sell emission allowances under the program — which can give a financial boost to cleaner sources such as wind or hydro plants. So far RGGI’s allowance auctions have raised more than $2.5 billion, with the proceeds flowing to the states, and most of them investing heavily in energy efficiency efforts. “All the evidence points to the fact that RGGI’s working well, it’s been a great success since its inception,” says Peter Shattuck, director of the Clean Energy Initiative at the Acadia Center, an an environmental policy group with offices in Maine and around the northeast. “[Since RGGI’s 2009 startup] carbon pollution is down 40 percent, electricity prices are down 3 percent, and at the same time [the participating] states’ economies have grown by 25 percent,” he says. Read and listen to the rest of this story. Maine doctors are prescribing far fewer opioids to patients compared with several years ago, a trend that experts say bodes well for future alleviation of the opioid crisis. However, it’s unknown how long it will take for the decline to have an impact on addiction rates and deaths, and the prescribing rates vary widely, with two of Maine’s 16 counties actually seeing an increase. The prescribing trends are captured in two reports – a county-level analysis published last week by the U.S. Centers for Disease Control and Prevention, and a national report with state-level data prepared in the spring by a Connecticut health consulting company, QuintilesIMS. The Quintiles report, done for the American Medical Association, showed that the number of opioid prescriptions in Maine fell 21.5 percent from 2013 to 2016. That’s the fourth-highest drop in the nation, which averaged a 14.6 percent reduction in the same period. Maine’s 0.7 per-capita opioid prescription rate now matches the national average. After an exhaustive search, we have selected two hikers who are taking on the Appalachian Trail this spring and summer to test our Maine Public App out in the fringes of civilization. Danny Moody of Winthrop and Dan Giguere of Manchester (ME) along with Danny’s dog Daisy are our first adventurers in our Here to There and Back project. There are many food seasons for foodies to enjoy in the county! Fiddleheads, local strawberries, fresh peas, beet greens…YUM! But the very best of all, and you are welcome to come to Aroostook and join us – new potatoes! All along Route 1 and other roads as you drive throughout the county, you will see simple farm stands with the (usually) hand painted sign saying “new potatoes”. These kiosks are typically on the honor system. You simply put your money into the container and grab a bag. Read the rest of this blog entry. AUGUSTA — Maine’s pioneering law banning highway billboards, enacted in 1977, is under siege at the State House. Lawmakers there are lining up behind nine bills that would grant variances to state sign regulations for individual businesses and attractions. 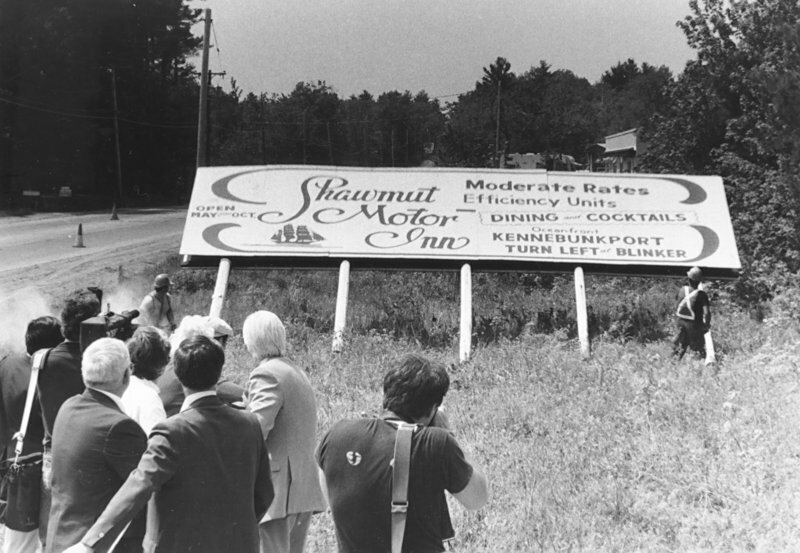 The last state-acquired billboard in Maine, on Route 1 in York County, is cut down by chain saw circa 1984. “Everybody wants a sign,” said Senate Minority Leader Michael Thibodeau, R-Winterport, in testimony in favor of a bill that would help a snowmobile club in his town keep a sign. But managers of Maine roads and a major environmental group say granting piecemeal changes would weaken sign laws. The Maine Department of Transportation wants all such bills tabled, and the Legislature’s Transportation Committee already has honored that request in three instances. AUGUSTA, Maine (AP) — Gov. Paul LePage lashed out at the media for reporting he planned to leave the state during a budget impasse, and he suggested he sometimes concocts stories to mislead reporters. “I just love to sit in my office and make up ways so they’ll write these stupid stories because they are just so stupid, it’s awful,” he told WGAN-AM on Thursday. Maine media, citing lawmakers, reported recently that LePage might leave the state amid a government shutdown. Republicans including Senate President Michael Thibodeau and Sen. Roger Katz said LePage had told them he planned to leave the state.